John Rumpler is clean water program director and senior attorney for Environment America. With the passing of July 4th, summer is officially in high gear in America. Perhaps more than any other time of year, this is when we enjoy clean water -- swimming at the beach, fishing in a creek, kayaking down a river, or sailing on a lake or bay. Unfortunately, corporate agribusiness is imposing a heavy - and growing - toll on America's waterways. According to the U.S. Environmental Protection Agency, agriculture is the probable cause of polluting more than 145,000 miles of rivers and streams, along with over 1 million acres of lakes, bays, and more. Last year, the dead zone in the Gulf of Mexico was the size of Connecticut and Rhode Island combined--the largest since 2002. And now, agribusiness is even threatening our drinking water - with incidents from Toledo to Des Moines, from Wisconsin to Washington State. How did we get to the point where companies selling us food are polluting our water? The answer lies in the industrialization and concentration of their agribusiness operations. 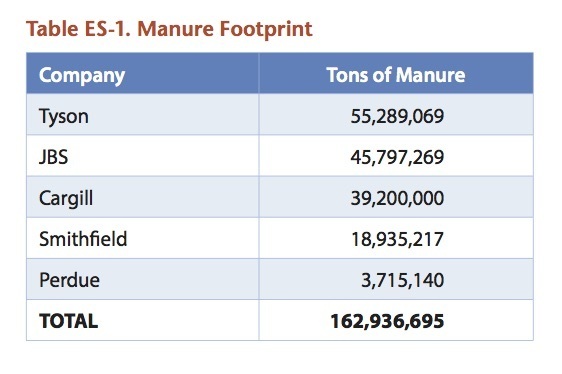 Factory farms produce huge volumes of manure with no place to put it. That manure is frequently over-applied to cropland, where it all too often flows into nearby rivers and streams. Moreover, pollution also runs off of vast acres of commodity crops (often grown to feed the millions of animals on factory farms). And finally, the huge slaughterhouses and other facilities to process meat and grain dump pollutants directly into our rivers and streams. To better hold agribusiness accountable, we need to start tracking the pollution threats created by individual companies. 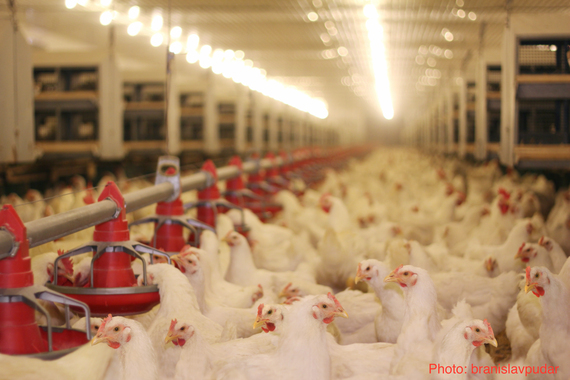 For example, Tyson Foods, Inc. is one of the world's largest producers of meat and poultry. Based in Springdale, Arkansas, the company has long been a dominant player in the region's high concentration of chicken production. It has additional operations in the Midwest and the Chesapeake Bay watershed. Environment America Research & Policy Center recently took a look at how Tyson's water pollution footprint stacks up against four other major agribusiness companies: Smithfield, Cargill, JBS, and Perdue. We published the results in our new report, "Corporate Agribusiness and the Fouling of America's Waterways." Using data available from EPA and the U.S. Department of Agriculture, we documented the manure load and direct dumping of toxic pollutants by each of these corporations. For both measurements, Tyson came out on top of the polluter pile - with more than 55 million tons of manure in its supply chain, and its facilities responsible for dumping 104 million pounds of toxic pollutants into waterways over a five-year period. To put this second figure in perspective: Tyson's toxic discharges for these years were 2nd by volume, as compared to all other industries. That is, Tyson not only dumped more toxic pollution into waters than Smithfield or Perdue; Tyson dumped a greater volume of pollution into our waters than Exxon, DuPont, or Koch Industries. Moreover, the vast majority of toxic pollutants Tyson poured from its processing plants were nitrates. Nitrates not only contribute to the dead zones plaguing our waterways but also threaten the safety of our drinking water, as they can cause "blue baby syndrome" and have recently been linked to certain types of cancer. Tyson's pollution has had particularly severe impacts on the waters of northwest Arkansas and eastern Oklahoma. When chicken manure contaminated two sources of drinking water for Tulsa, Oklahoma, Tyson and other poultry processors agreed to pay the city $7.5 million. And when the Illinois River and several tributaries became so polluted with pathogens from animal waste that they were no longer safe for swimming, the Oklahoma attorney general sued Tyson and several other chicken processors to clean it up. Since then, Tyson has been charged with numerous violations and pollution incidents. In 2015, for example, Tyson settled a case in Missouri for releases into a municipal sewage system that ultimately resulted in killing at least 100,000 fish in Clear Creek. Will Tyson begin to curb its massive water pollution footprint? So far, the signs are not encouraging. While the company's environment webpage highlights efforts to address water consumption, it has no reference to water pollution. Moreover, Tyson's own 2015 sustainability report shows that the company exceeded water pollution limits on hundreds of occasions in recent years. Finally, in the past two years, Tyson has twice rejected shareholder resolutions calling on the company to reduce its water pollution. Of course, it doesn't have to be this way. We know how to grow food without polluting our water. Take second-generation Missouri farmer, Terry Spence. 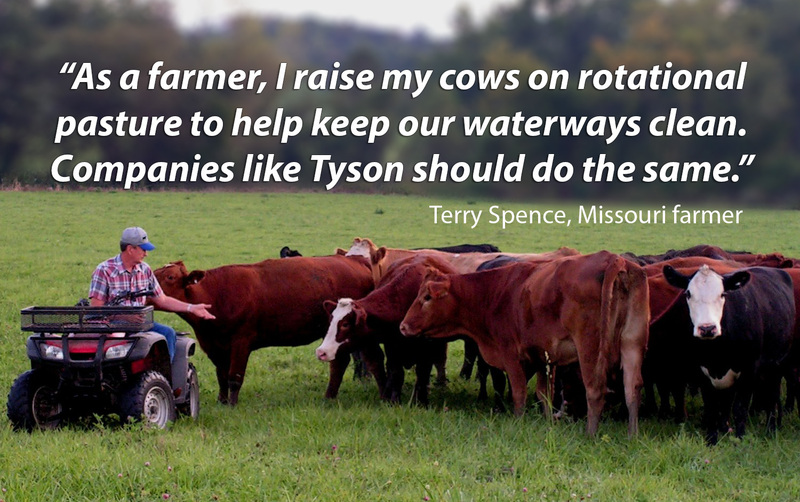 Terry raises his cattle on rotational pasture to nurture the soil and keep manure from flowing into nearby streams. "As a farmer it is my duty to preserve our land and water resources for future generations," he said during a recent call with reporters. "And it's high time these companies look beyond their profit margins and do the same." We couldn't agree more. It's time to protect our rivers and streams - and our drinking water - from the pollution of agribusiness giants like Tyson.